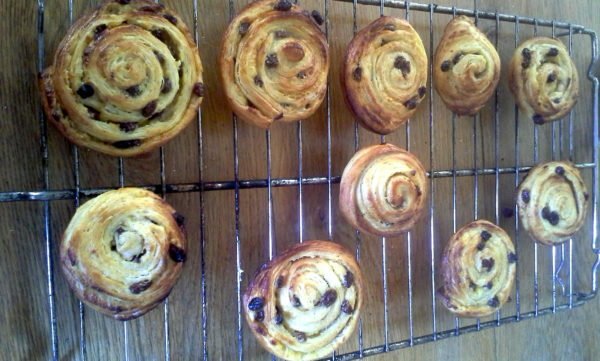 Above are some examples of bread baking using a home-made sourdough starter or in the case of the Pain au Raisin, commercial yeast. The breads feature different types of slash pattern that enables the dough to rise in a controlled way. 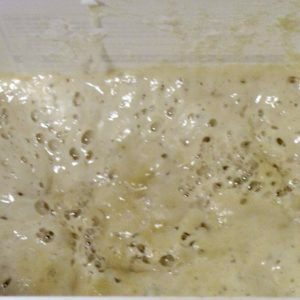 Sourdough requires a natural leaven made from just water and flour left open to natural yeasts in the air to start the fermentation. 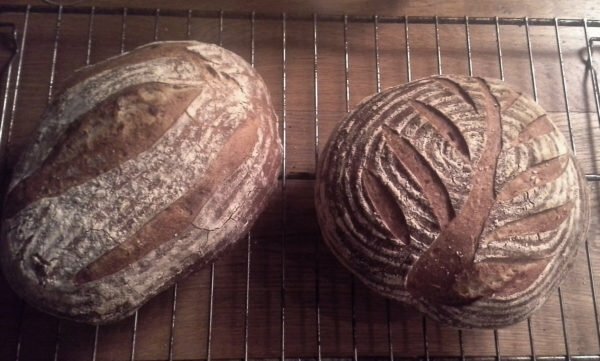 It usually takes several weeks to get a viable fully active Levain or starter, one that is bubbly enough to grow fast within the dough and has got that classic tangy sour smell so typical of the bread. 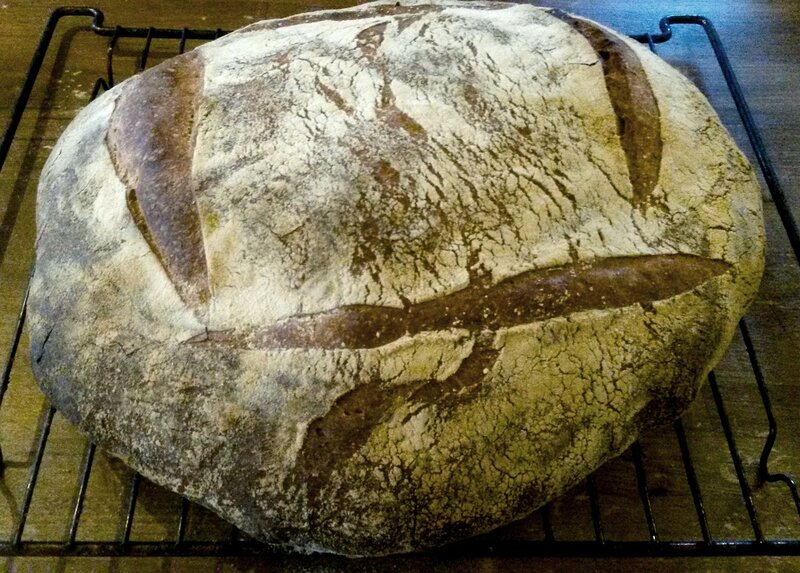 The flour for the starter can be any good quality organic bread flour, white, brown, rye or a combination. Wild yeasts do quite like rye as a food so adding a bit in always helps. Always mix at 100% hydration-so normally 100g of flour to 100g water- mixed in a closable clean container to keep unwanted moulds out. Stir every day until you see small bubbles appearing then pour half the mixture away. Add fresh flour/water as before until the bubbling is more pronounced. Keep discarding half the mixture until the mixture is really bubbling well and even trying to get out of your container! 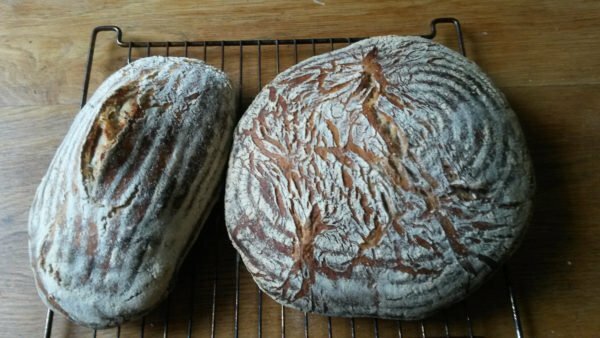 There are many recipes for basic sourdough bread baking on line but the fundamentals are this- measure out your volume of flour, say 600g, and put into a bowl. On your kitchen scales, we’re going to aim for approx 1kg 70% hydration loaf, so measure 400g of water and 100g of levain and add to the flour. Don’t mix it, just leave it there for about 30mins- this is known as autolyse- and helps the fermentation process start. Both work but with folding, all you do is keep stretching one side of the dough and pulling it over the other side and then resting. You do this every hour until you feel the dough change- it will start to feel pillowy and resistant to breaking. It means the gluten is aligning itself in strands and strengthening the dough. If it feels loose, give it another fold and rest. From your blended mix, pick up your dough with two hands, thumbs on top, and keep flipping the dough over on itself. It will be horribly sticky to start with but after about 5-10 mins it will tighten and come together as a ball. 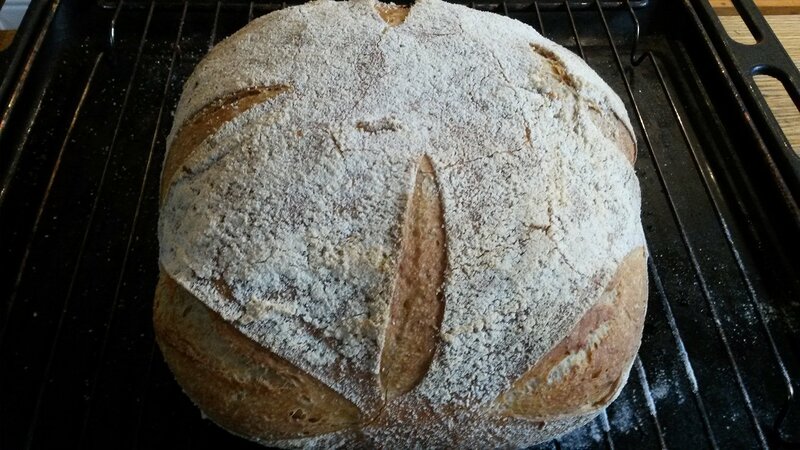 Ideally knead for about 15 mins then rest and leave to rise. 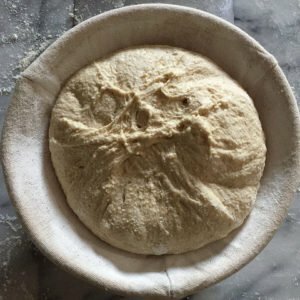 Proving- does your dough rise? The dough should now rise slowly. Again there are several ways forward. Let it rise naturally in a cool room until double in size or leave tightly covered in the bowl overnight in the fridge. The cooler and longer the proving the better tasting the dough will be. Either way when doubled in size, knock back and stretch the dough out into a square, pulling each corner out and folding it back in on itself. This stretching tightens the gluten. Keep stretching the dough a few more times and let rest. The idea now is to drag the dough toward you with a tiny amount of flour so that it really tightens and forms a ball. Use a scraper to drag it and eventually you’ll get a tight ball with a taught skin. There are again several ways to contain your loaf- a tin, a banneton or cloth lined basket or a couche which is a floured linen cloth that is folded to support the dough. Take your dough and scoop it up with your scraper and turn it upside down into a banneton so that the top is down. For a tin, you’d scoop up and drop it top up and for a couche, you’ll more than likely form a longer loaf and drop it upside down. Let is rise again until when poked gently will return slowly to its original form. 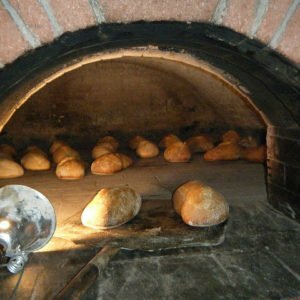 The oven or wood-fired oven should be preheated to about 250C, some bakers go a bit lower some higher but either way the baking time will be adjusted accordingly. If baking in an oven in the kitchen try and use baking stone as its good at retaining an even heat and put a tray with a small amount of boiling water at the bottom for steam. Turn out your risen loaf onto a small floured peel so the top is now up, flour it and slash with a very sharp knife or Lame ( a short handle with a razor blade ) and slide onto the stone. Bake for 30-40 mins until it sounds hollow. A tin can be put straight in after you’ve floured and slashed the top. If on a couche, flip the dough upside down onto your peel, flour and slash as above. When ready, your loaf will sound hollow, well browned and crusty. It will crackle as it cools but don’t get tempted to eat it yet no matter how hungry you are, the starches are a bit indigestible whilst hot. The starches need to set so once its cooled down to room temperature get stuck in and enjoy your handiwork. If you’re lucky and everything worked out, you should have a well risen loaf, full of air bubbles, crusty and slightly caramelised on the outside and light, fluffy and tangy on the inside. Artisan Bread baking is an adventure, many things can and do go wrong at every stage but bakers know that working methodically helps to eliminate those errors. Write down your successful recipes and pass them on and when you’re ready for the ultimate test, buy yourself a wood-fired oven and up your game! You never know, you may catch the bug and try and do it professionally so if you do, please know we are here to help you get started with trade discounts and advice. 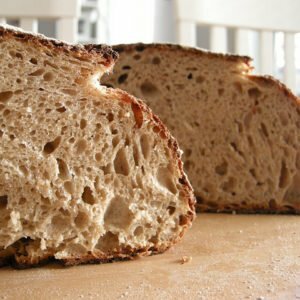 If you want to join fellow bread bakers on your journey, consider joining the Real Bread Campaign, a force for getting the industry to make better bread and encourage artisan bakers in their quest for great tasting bread.